Aerin will launch Tuberose Le Jour and Tuberose Le Soir, two new fragrances for women, in August. 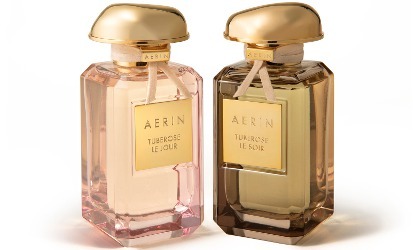 Aerin Tuberose Le Jour and Tuberose Le Soir will be available in 50 ml. Update: the descriptions in brackets above are via Bergdorf Goodman, where Tuberose Le Jour and Tuberose Le Soir are $305 each for 100 ml. Another update: The 50 ml bottles are $215.